My Creative Time: HAPPY TEACHER APPRECIATION WEEK, a Guest Designer & Day Four Online Watercolor Class! HAPPY TEACHER APPRECIATION WEEK, a Guest Designer & Day Four Online Watercolor Class! Good morning my sweet friends & HAPPY HAPPY FRIDAY!!! I thought this day would NEVER get here! It's been a CRAZY BUSY week! For my card today, I FINALLY used my Tim Holtz distress stains! YEP, I can't even believe it my self~ ;) I believe the colors I used were: Picked Rasberry, Salty Ocean & Seedless Preserves. I learned this technique from Miss Yana Smakula's instructional video yesterday! She basically applied all of here inks directly onto a good size stamp clear block, then took a wet paint brush & started to blend the colors oh so slightly! But, I found that adding Versamark to your clear block first, for some reason applies your ink much better onto your watercolor paper. I saw Miss Jennifer McGuire add Versamark ink to her block in her instructional video a few days ago! So, after I applied my inks to the block & blended them just a tad w/my wet watercolor brush, I grabbed one of the background stamps from "Build a Chevy Background", proceeded to stamp it directly onto that ink that I put onto the bigger clear block! Then I stamped directly onto my watercolor paper! I proceeded to do this 4 separate times to get the chevrons on here w/different lengths! Next I stamped the word "amazing…" from "Treasured Moments" using Jet Black Archival Ranger ink! The "you are" die is from my upcoming May Release! ;) So, after I finished the first layer, then I sprayed the ink that was leftover on the big clear block, then took a piece of watercolor color paper & rubbed it directly onto the ink & basically smeared it all over until it was completely covered in these AWESOME distress ink colors! Before I adhered my 1st layer onto the fully watercolor background piece, I tied a piece of kraft color hemp twine to it & made a bow! Then I used my pop up rage to adhere it to the colorful background piece, then adhered them both to my black card! Okay, for my next 2 items, I wanted to share w/you the Teacher Appreciation presents Anthony gave to his teachers! These were cute pens in a pot that were made by one of our board members from our travel baseball team! 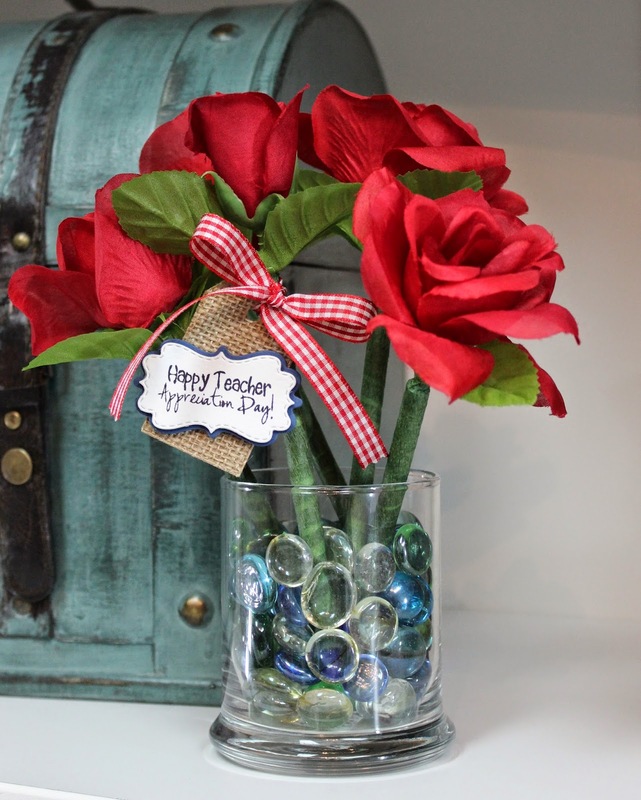 It was a fundraiser for Mother's Day, but I decided to use mine for Teacher Appreciation Week! Anthony has 2 lady teachers so he gave these to them along w/a gift card from my FAVE place in the whole world "Starbucks"! hehehe! Here is the 2nd one! Basically all I did to these was add the tag! I used my "Round Tab & Tag Die" & layered my "Stitched Curly Label Die" onto my "Curly Label Die". The teacher stamp is from my "My Teacher Rocks" stamp set! For his other 3 "man" teachers, Anthony gave them Starbucks gift card! Since Baby Aaron has way more teachers, it was easier for him to just give them ALL Starbucks gift cards! Your card came out so awesome gosh there sure were a lot of steps to get your final look but gosh the look is so pretty. I sure can tell you had a lot of fun and truly enjoyed your self and as they say "The proof is in the pudding" and girl you've done a great creative job each and every day your inner artist was hiding but it sure ain't any more (LOL) love everything your did. Your boys teach appreciation gifts are awesome they are in for a real treat and yeppers great idea for the Starbucks gift cards they are all going to love it you are the best!! Your card is awesome Emma, love the teacher's gifts. It is so nice to think of them, I know how you feel about that :) Monica, your project is gorgeous. I have been loving your watercolor cards this week, they are so beautiful. I hope you have a wonderful Mother's Day and Happy Birthday tomorrow! Beautiful watercoloring! I love the gifts and Monica's project is beautiful! Have a great weekend! Your card is so pretty Mrs. Emma:) I love the colors you used, and not mention May's sneak peek. Thank you so much for allowing me to be guest designer on your blog, It is truly in honor. Emma ~ Well your card turned out simply BEATUIFUL! I LVOE the colors and oh my look at that sneak ~ hehehe ~ LOVE it already! Well then you teacher gifts ~ OMG what CUTE and PERFECT ideas! Well Miss Crafty Moni ~ Monica ~ Did an AMAZING and BEAUTIFUL job too! Just ADORE her idea too! Beautiful job ladies!!! sooooo PRETTY!!! all of your watercolor projects are "AMAZING"! 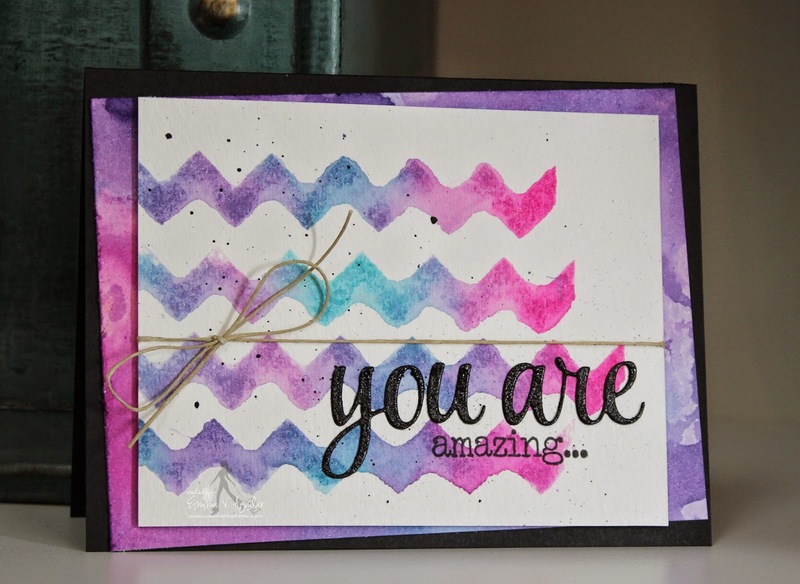 Love the watercolor stamping! So pretty! I must say I am enjoying you enjoying your watercolor class and sharing your work. Another super technique and tip to versa mark the block. Super job.